Domenico de Clario is an interdisciplinary artist, academic, writer and musician. He was born in Trieste, Italy, in 1947 and migrated to Australia in 1956. He studied architecture and town planning at Melbourne University, painting at Milan’s Accademia di Belle Arti di Brera and lithography at the Accademia di Belle Arti di Urbino. In 1998 he was awarded an MA and in 2001 a PhD in performance studies from Melbourne’s Victoria University. He taught in the art school at RMIT from 1973 until 1996 and from 1998 both at the Centre for Ideas at VCA and at Victoria University. 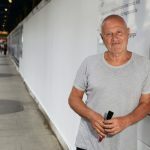 He was head of the School of Contemporary Arts at Perth’s ECU from 2001 to 2006, head of the School of Fine Arts at Monash University from 2006 to 2009 and director of Adelaide’s Australian Experimental Art Foundation from 2009 until 2012. From 2008 until 2013 he was adjunct professor at the University of South Australia. Since 1966 Domenico has presented more than 300 solo and group exhibitions, installations and performances and has published a number of books and CDs. He has been the recipient of numerous national and international residencies and grants, including the Australia Council Fellowship. His work is represented in major public and private collections both in Australia and worldwide. Head of the School of Contemporary Art and Associate Dean, Research and Development, Western Australian Academy of Performing Arts, Edith Cowan University, Perth, West Australia. Head of Department of Fine Arts, Faculty of Art, Architecture and Design, Monash University, Melbourne. Artistic and Managing Director, Australian Experimental Art Foundation, Adelaide. Curated various projects at the Australian Experimental Art Foundation, Adelaide, including ‘gone in no time gone in no time’, ‘duetto’ and ‘(to) give time to time’ (also in Mildura). cares of a family man (philomela and odradek), sound performance, Adam Art Gallery, Wellington N.Z. eleven sons, installation/texts, Albany Wind Farm, Albany, W.A. the infinite lawn, all-night sound performance, Deer Acres, Acadia, Maine, U.S.A.
pietre parlanti’, sound performance, Corte del Teatro Malibran, Venice, Italy. the albino gorilla, installation, Southbank, Brisbane, for Monochromes. The Cauldron - Fusion of the 5 Elements with Liza Lim, Deborah Kayser, Chris Lockhart Smith, Kirsten Boerema, Carl Rosman. Heathcote, C. (1992) "Exhibition puts a satirical spotlight on local installation art", The Age, Sept.
McKean, M. (1973) Contemporary Australian Painting & Sculpture, ex. cat. Mori Gallery (1991) Chicago International Art Fair, ex.cat., Chicago, U.S.A.